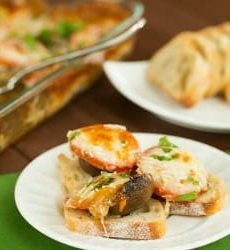 Continuing down the road of appetizers, dips and snack food leading up to the Super Bowl, I give you this somewhat “upscale” game day food. 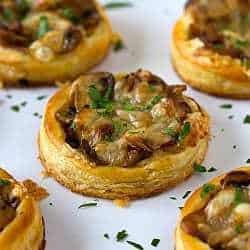 Caramelized onions, mushrooms and Gruyere cheese are baked atop circles of puff pastry for a flaky, savory and delicious appetizer. 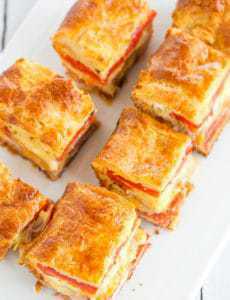 Another occasion that this appetizer would be great for? A baby shower! Fellow food blogger Annie from Annie’s Eats is expecting her second baby in April (a girl!) and a group of bloggers organized a virtual baby shower to celebrate Annie’s bundle of joy, and of course we all brought food to the party! 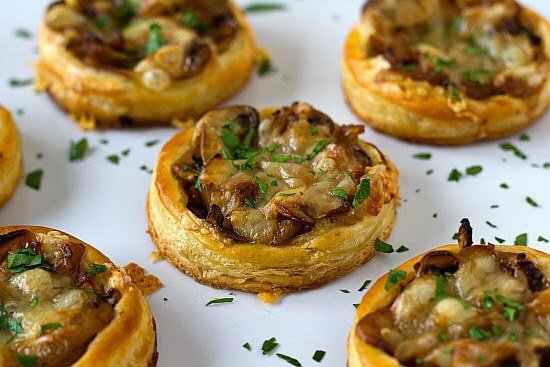 Since appetizers are my second love behind desserts and this is Super Bowl week, I definitely wanted to go that route, and thought that these little tartlets would be something Annie and other ladies at a shower would certainly enjoy. To see all of the great drinks, appetizers, main dishes and desserts that other bloggers contributed to the virtual shower, head on over to Annie’s and Courtney’s blogs for the roundup. For more on the tartlets, keep reading! 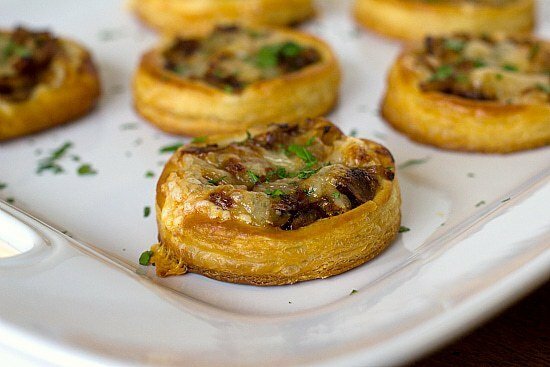 One of the great things about these tartlets is that you can cut the circles smaller or larger depending on how many you want to serve or how truly bite-size you want them to be. I did 3-inch circles, but you can definitely adjust depending on your needs. 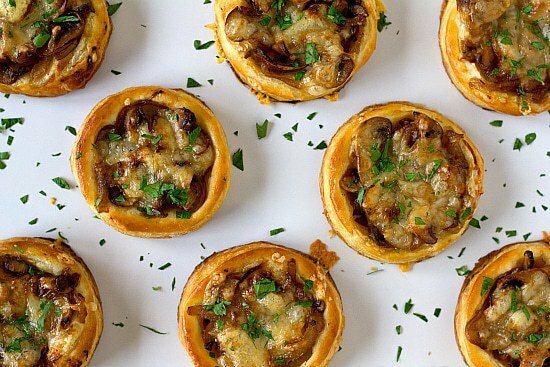 The caramelized onion, mushroom and gruyere cheese tartlet recipe sounds great, but is something missing in the Directions? I don’t fully understand the part about cutting the 4 score marks. Do you cut them around the perimeter and THEN fold up the edges? Or, do you cut them at a point 1/4 to 1/2 inch in from the perimeter just so the pastry can “breathe” as it cooks, and not fold up the sides?? Look forward to hearing back about this. Hi Dale, You score around the perimeter, but do not fold up the sides. Enjoy! Hi! This recipe looks delicious (and seems that way from the many comments). 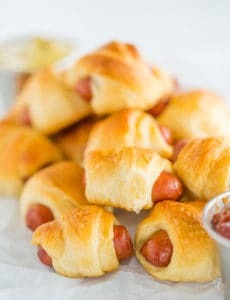 I was wondering if I could make this recipe but use pie dough instead of puff pastry? Thank you in advance! 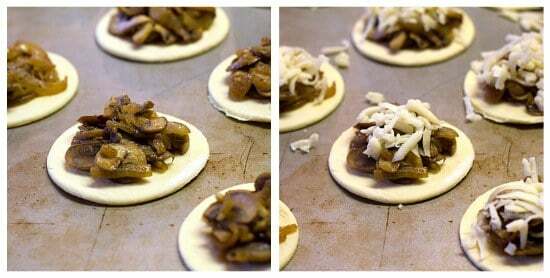 Yes, pie dough would definitely work, too!